One day, I was walking down the street in San Francisco, and a little van pulled up, giving out samples of some cracker looking things. They had little plastic cups, each with 2 or so crackers in it. They turned out to be called "Good Thins", a product sorta like a cross between a cracker and a chip, boasting all the labels you'd expect: no artificial flavors or colors, no cholesterol, no partially hydrogenated oils, no high fructose corn syrup. They have 60% less fat than standard potato chips. A healthier snack. While I do love snacks, these quasi healthy chip like things didn't really sound that interesting to me, but of course I tried some. They turned out to be rather awesome. Good Thins come in a slew of varieties, with all different bases: potato, chickpea, corn, oat, rice. The rice and corn ones are gluten-free. The ones being sampled that day were all potato based, which come in white cheddar, sweet potato, spinach & garlic, and "original". (If you are curious, rice based varieties are salted, veggie blend, poppy & sesame seed, and sea salt & pepper), chickpea ones come only in a garlic & herb flavor, corn come only salted, and oat with flax). I tried the spinach & garlic and the sweet potato at the sampling site. I liked them both, so much so that when I saw them in the store later, I actually bought a box, a rare move on my part, since I don't tend to have a shortage of snack foods laying around the house. I'd gladly eat more of these. "Sweet Potato GOOD THiNS are made with real sweet potatoes. So if you share them, you're sure to hear "Sweet. You're the sweetest." 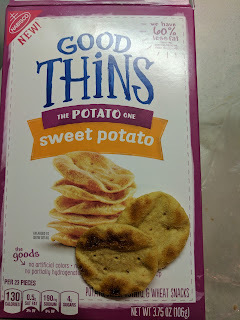 The Good Thins actually look just like their box picture (those are the real things on the right hand corner here, on top of the box). They are round, thin, and crispy. The form is perfect for munching, much like a chip, but a bit bigger. The flavor in the sweet potato ones was a bit sweet. I really was impressed with how much sweet potato I could actually taste. But the best part? The salt level. They were so salty, in a totally addicting way. I thought these were remarkably good, and they hit all the check boxes for me - sized just right, crispy, salty ... just excellent snack food. I was also pleasantly surprised to learn that a serving is only 130 calories, and a serving is a whopping 23 chips! 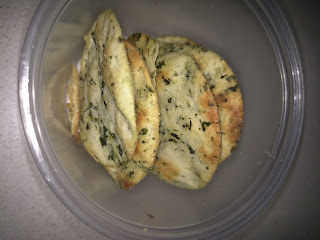 I didn't take notes on the Spinach & Garlic when I tried them on the street, but I also liked the thin, crispy form, and the excellent salt level. I remember finding this flavor quite savory, and appreciated that they tasted kinda healthy from the spinach, but also, actually tasty. Pastéis de Belém. "The Egg Tart Place". 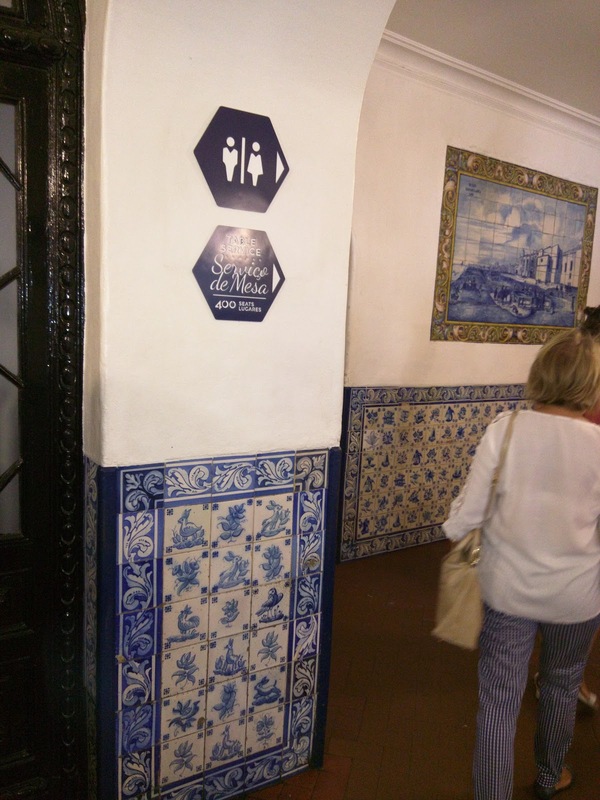 The most famous place in Lisbon probably. On every list, mentioned in every guidebook for Lisbon. Epic long lines. Yadda yadda. I'll be honest. I didn't really expect much. Everyone told me to go to Pastéis de Belém. 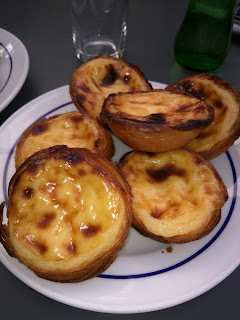 Everyone says the pastel de nata are best ever. People rave about all sorts of things all the time though. The hype was too much, and, I rarely, rarely find anything, particular sweets, worth the hype. 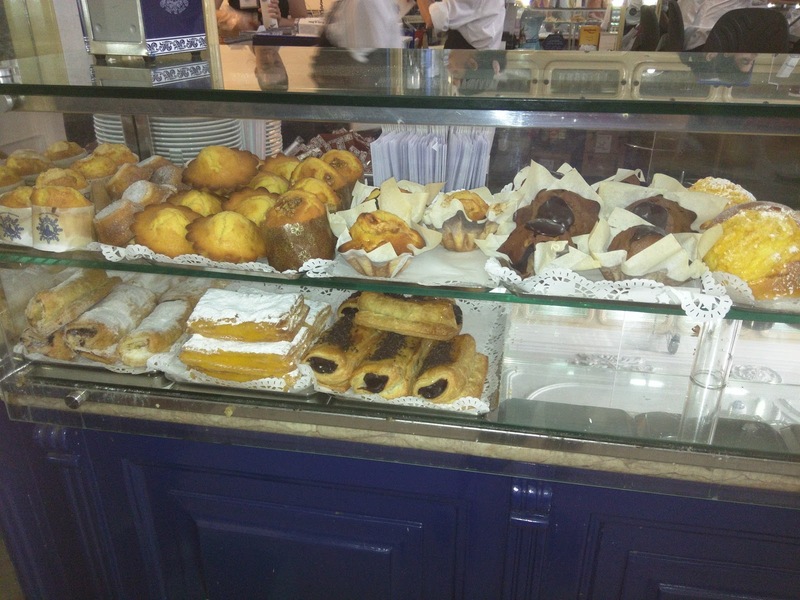 And then I went to Pastéis de Belém. There is a reason why it is in every guide book, why every person who you mention Lisbon to will tell you to go, why the lines are insane. Because, well, the pastel de nata *are* the best ever. I honestly didn't have any concept of how good an egg tart could be until I went there. The place has a good history too. 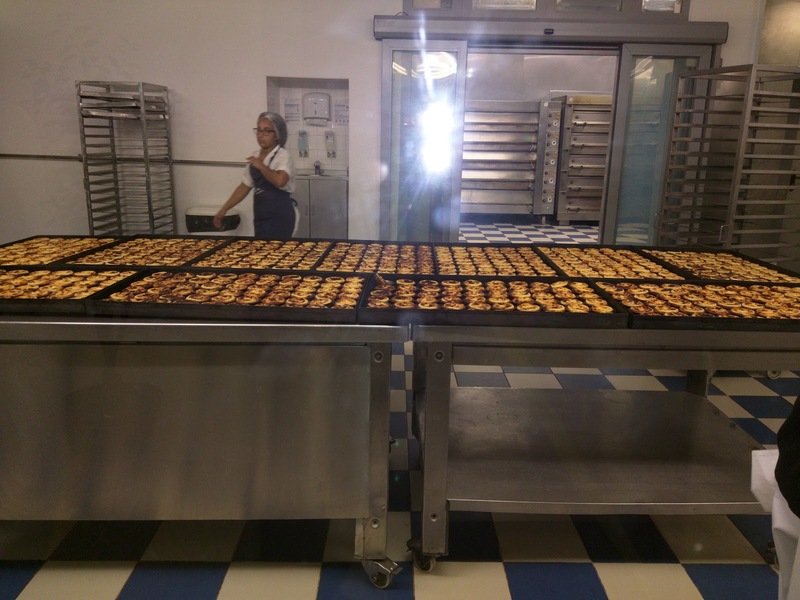 The history goes something along the lines of pastéis de nata were created by some monks in a monastery in Belém, to use up the egg yolks leftover from all the eggs that the nuns used the whites from to starch their habits. There was a religious revolution, the monks started selling the tarts as a source of income, the monastery was closed, and turned into a pastry shop. It has been around since the 1800s. Anyway. Go to Lisbon, and just go here. Forget about everywhere else. 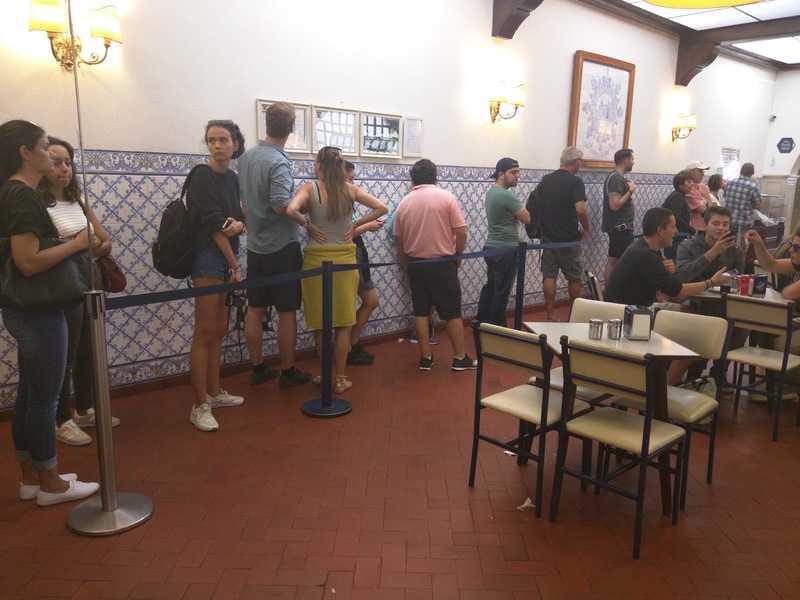 Get a pastel de nata. Or 10. And bring me with you. You'll easily identify the shop as you approach, as the crowds are epic. Extending out on the sidewalk is the longest line, for takeout. There are plentiful signs indicating what the line is for, and orderly ropes to keep people from taking over the sidewalk. For lines, these are very well managed. The line leads to the pastry counter, with extensive selections. This first area had stuffed donuts, savory choices, eclairs, and cakes. 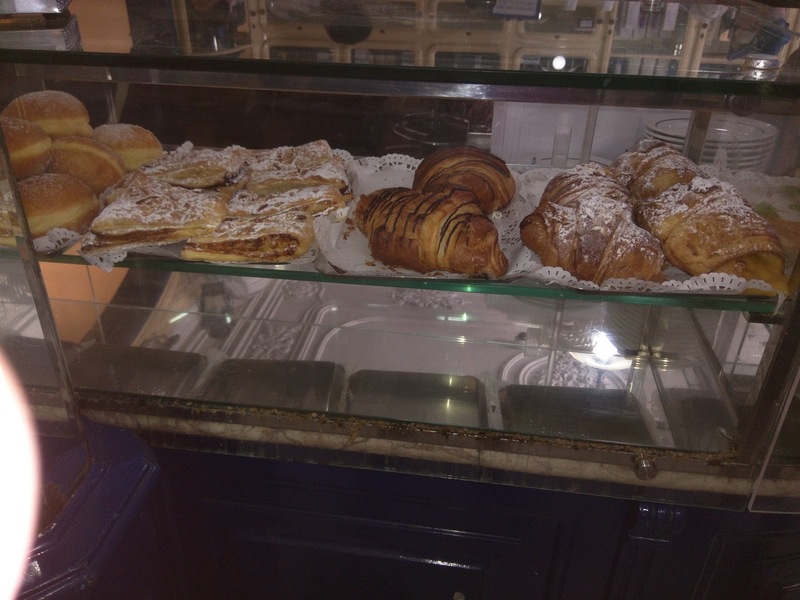 There were croissants with assorted fillings, and tarts. And quiches, and more savory pastries. And muffins, filled rolls, and more. There was no list of items anywhere, and nothing was labelled, so, I'm not really sure how people were supposed to know what anything is. Or if they did. Maybe everyone just gets tarts and these are for looks. There is good signage indicating where to go for table service. 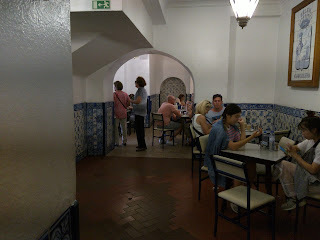 To get to the line, you wind your way through the entire, spacious restaurant first. 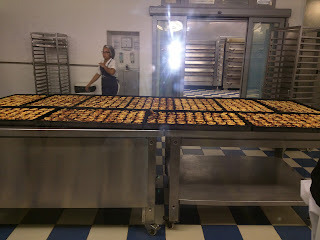 And you go past the open kitchen, with trays and trays of tarts laid out. They clearly make, and sell, a ridiculous number of these things. Eventually you find the line for seating, also with ropes to keep people in order. 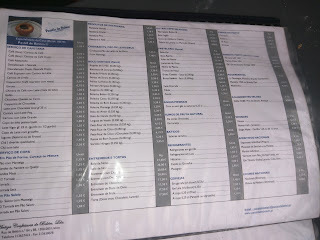 I'm not sure how many distinct rooms the restaurant has, but we wound our way through many, all of varied sizes. Some had just a few tables. The single seating line services all areas. Other areas were huge and open, and packed. At all times. There was another huge room, vacant, because it was reserved. They have 400 seats total in this place, ridiculously impressive, as it doesn't seem like it from the outside, but its just a total maze of rooms all over inside. 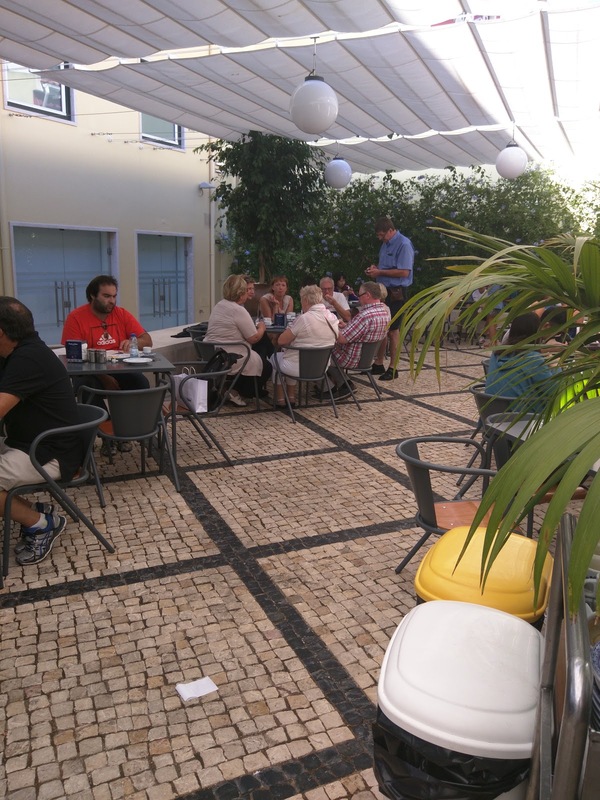 There is even an outdoor patio, with some plants, under a shade structure. It is here that we were seated. We were pointed at a table, still filled with dirty dishes, and with fewer chairs than we had people. We stood around awkwardly hoping someone would clear the table, or bring us a chair, but, it didn't happen. Eventually we sat, and eventually someone cleared the table. Tables and chairs are simple metal. Napkin holders are on the table with thin paper napkins. And that's it. No table clothes, place mats, silverware, anything. Simple. Eventually, someone also brought us a couple menus, again, fewer than we had people. 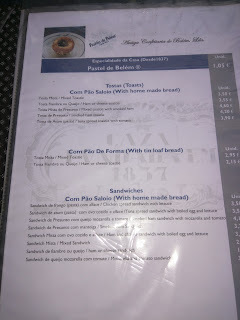 The menus were partially in English, partially in Portuguese, and we really had no idea what anything was. In the end, we kinda just gave up and ordered random stuff. Menu Page 1: Toasts & Sandwiches. The first page made sense. 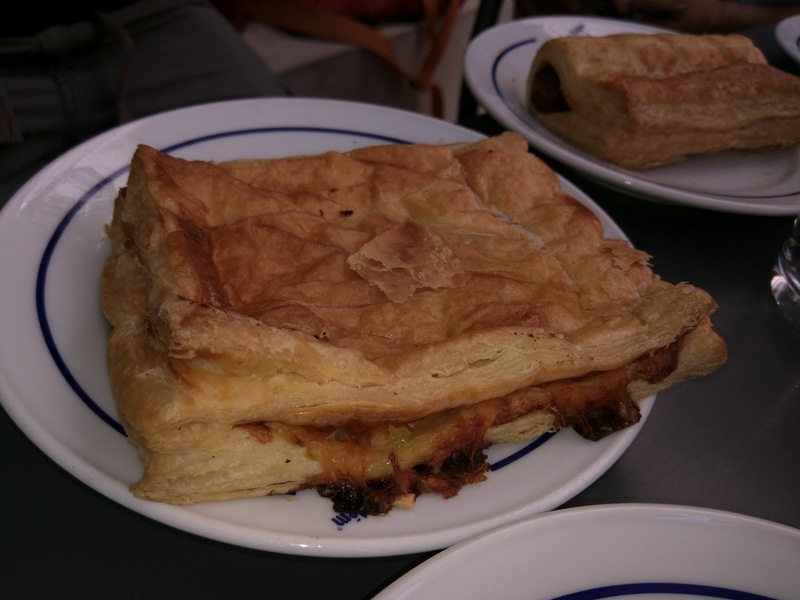 It had the pastel de belém featured right on top. Next were toasts (some with home made bread, some with "tin loaf bread") and sandwiches (with home made bread). This was in English and very clear. 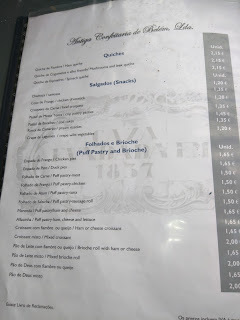 Menu Page 2: Quiche, Savory Pastries. Next came a page with quiches, snacks (like samosas? 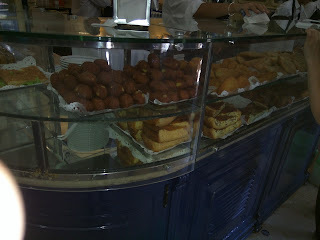 ), and filled puff pastries and brioche. Again, English provided, again, sensible. And then there was this page. All in Portuguese. 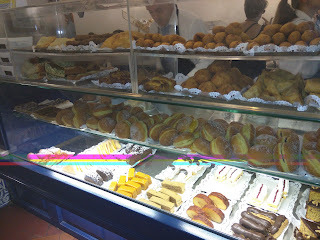 The first two pages were all savory (besides the signature tarts), and, I clearly wanted the sweets I saw out front. We tried using Google Translate, but didn't get far. When our server came to take our order, we tried ordering a few things from here, and he responded with things like, "Only available at Christmas" and "That comes in a bag". We gave up, and just ordered randomly. Our group of 8 just started calling out some items at that point. Those who wanted savory items ordered individually, and we threw on a bunch of donuts, since we could at least identify those, and I was interested to try a different style of donut. A feast for 8, < 10€ each. Insane. "Puff pastry / ham / cheese." 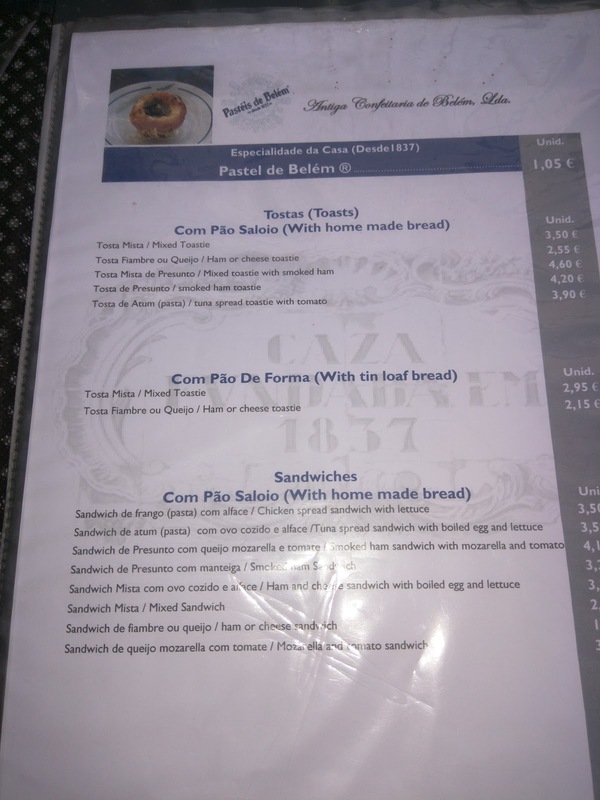 Ojan originally ordered a ham sandwich. Then he considered a ham and cheese toastie instead. Then he decided he wanted the ham and cheese puff pastry. He switched his order while our poor server was busy still taking our ridiculous group order. It was ... ok. 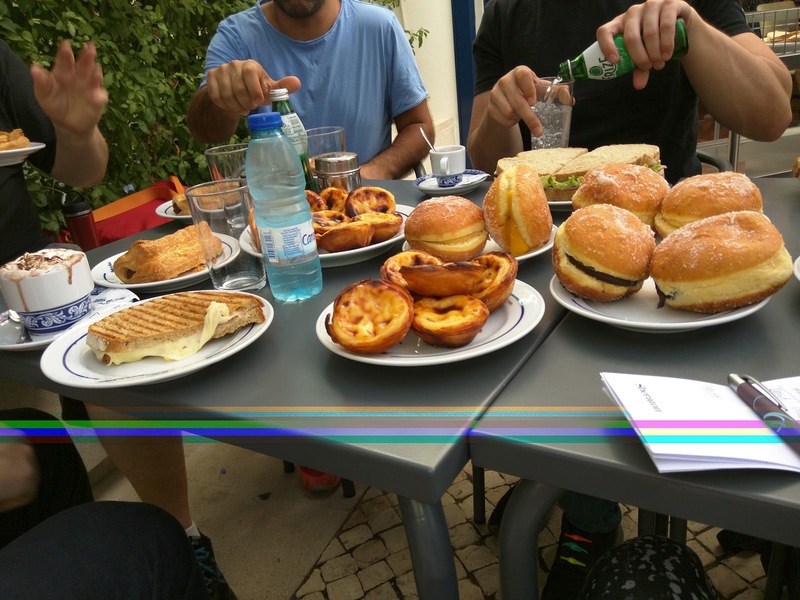 Unlike the egg tarts and toasties, it was served room temperature. His comment was that it would be really good if it was warm, as it was, it was just ok. I tried a bite, but, it was so unmemorable that I I didn't take a note, or even remember enough to write it down now, just an hour later. Ojan only had a few bites, and opted to save it for later, since it was room temperature anyway. I didn't try any of the other savories, but others had sandwiches on homemade bread, toasties (that were actually warm and had melty cheese), sausage rolls (that just had thin sausages inside), and quiche. No one really had much to say about any of that, not that I expected them to. 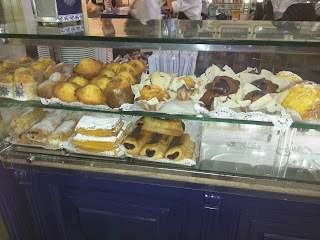 Pastel de Belem. 1.05€ each. 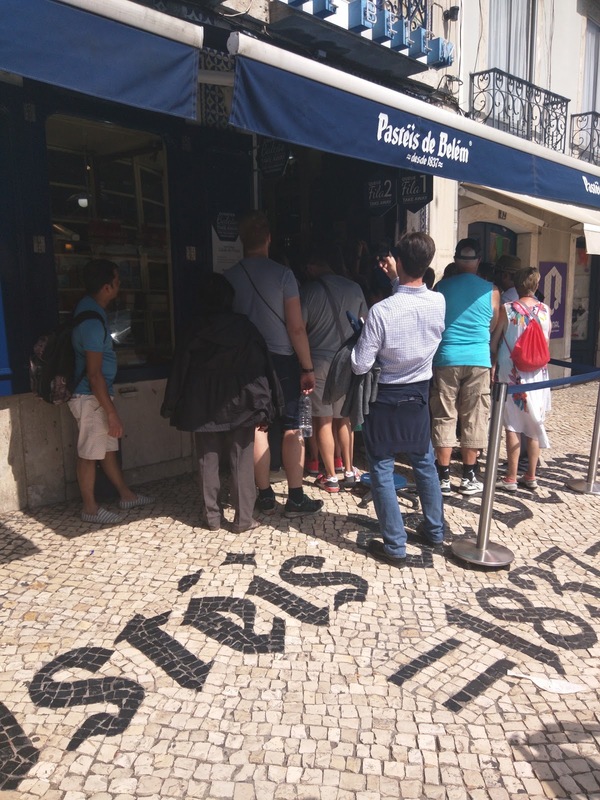 We were really just there for the pastel de belem right? Wow. Just, wow. I took one bite, and declared something along the lines of "holy wow". Everyone kinda looked at me funny. "Do you want to say more? ", they asked. I said, "no, we need a moment of silence for how amazing these are." And that is all I said. I didn't have words for how good these were, and I still don't. Yes, they are egg tarts. Yes, they have a flaky pastry shell, and custard filling. By description, I've had this sort of thing many times. But really, I've never had anything like this. It transformed my opinion of what an egg tart even was. These are in a class of their own. They were served warm. On the table is powdered sugar and cinnamon shakers, and I guess traditionally you sprinkle some on. They were fine with or without. I didn't really have a preference. The pastry shell was the definition of crispy and flaky. They looked sorta burnt, but, they weren't. They looked a bit too greasy, but they really weren't. 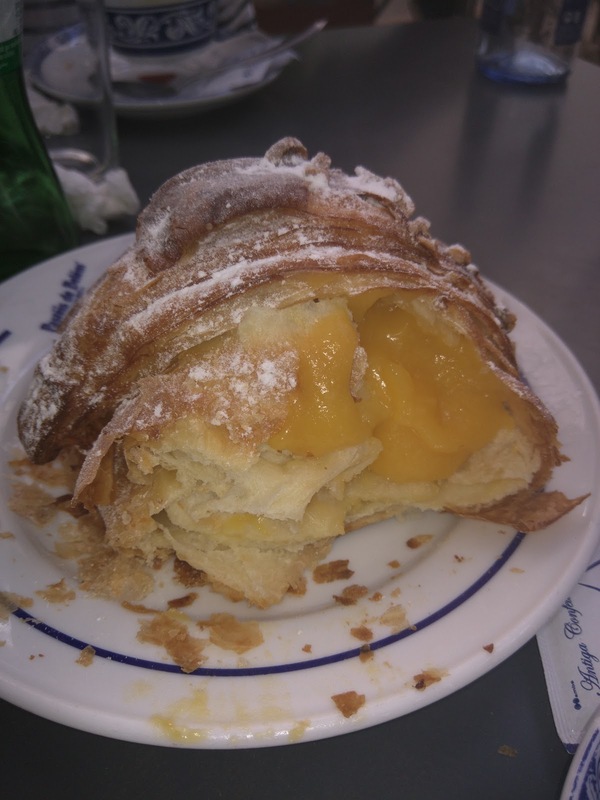 Really incredible pastry. And the filling. Swoon. Creamy, rich, sweet but not too sweet, custardy but not too custardy ... just, perfection. 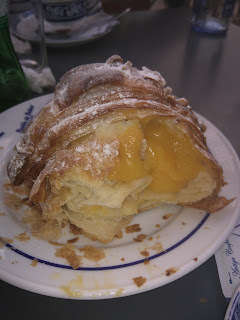 Ridiculously crispy exterior, amazing pastry, warm creamy custard. Oh my. I know they still just sound like any old good egg tarts. I don't know how to convey how life changing they were. I could have eaten a dozen. I wished we didn't order anything else, that I didn't waste precious stomach space trying the other things, that I'd fasted for days, or that I could just simply move in and sit there all day eating these. Seriously, insane. 1.05€ each. Seriously? Seriously? How is something so perfect so inexpensive? "Donuts: Vanilla Cream Filled, Egg Custard Cream Filled." The donuts looked better than they tasted. The donut itself was just ... ok. They didn't seem particularly fresh, not that they were excessively stale either. They were just ... fluffy donuts. I wish I hadn't bothered with these, and just had about 3 more tarts instead. But, we had piles of donuts to try. Each was split in half, and filled with our choice of filling. We decided to get 2 of each of the three options (vanilla cream, chocolate cream, egg custard). All were topped with powdered sugar, and had filling spilling out. I cut them into quarters so everyone could try them all. I started with vanilla, as that was the one I wanted. I figured it would be like Boston Creme filling. It was ok, basically just vanilla pudding. Creamy, slightly vanilla flavored, sweet. Not bad, but not noteworthy in any way. No one really liked these. I moved on to the custard one. Usually I'm not much of a fan of custard fillings because they can be too eggy, and this was bright yellow, so it certainly was loaded with egg yolks. But given how amazing the tart custard was, I had hopes. Ojan took a half of one, anticipating greatness, and then tried to give me it after one bite. I accepted, only to scoop the custard out of the center, discarding the donut itself. The custard was ... interesting. Very thick. Very rich. Very, very sweet. Only a tad bit too eggy for me. I almost liked it. There was something gritty about it that wasn't actually off putting. Overall, donuts themselves not great, fillings not noteworthy. Skip. "Dark Chocolate Creme Filled Donuts". We also had chocolate cream filled ones. 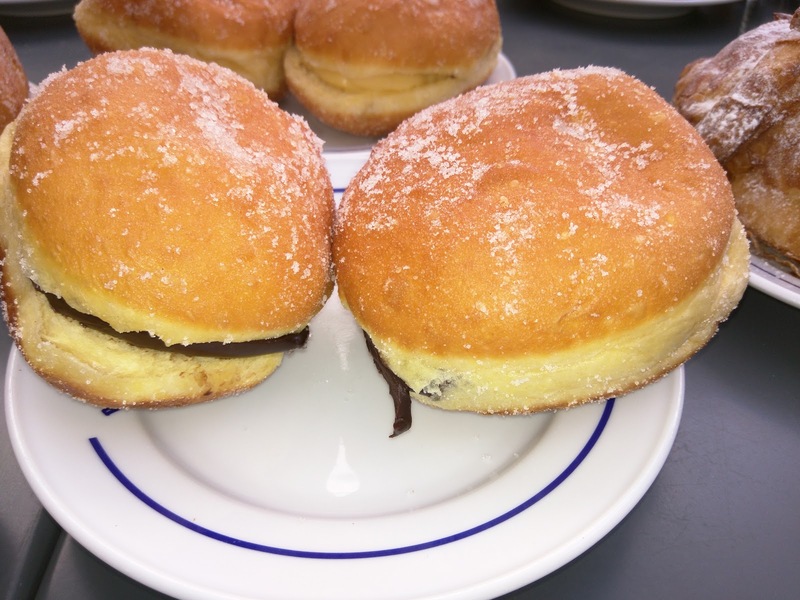 The donuts were again fairly lackluster, but the chocolate cream filling was the best of the bunch. Very rich, dark chocolate pudding. Still, not nearly as good as the tarts. Noticing a theme here? Just get the tarts. Someone also manged to order this. It was ... fine. The croissant dough was actually nicely layered and flaky, and it was crispy outside, and moist inside, but it lacked a bit of butteryness that I'd like to see. Plus, it just couldn't compare to the tarts. 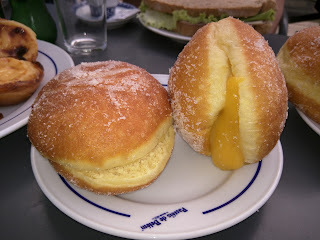 The custard was the same as from the donut, good, thick, rich. Years ago, I used to frequent Sushi Sam's, as it is halfway between my office in Mountain View and my home in San Francisco. It was a good place to stop when traffic on the 101 was bad, or, uh, whenever we wanted sushi. 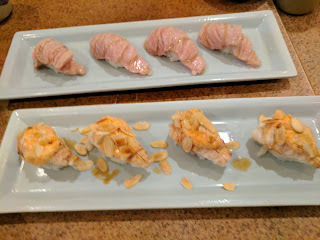 It was the first place I experienced omakase, and the first modern style sushi I ever had. It holds a formative place in the culinary growth I went through when moving to the Bay Area, and for that, it will always remain special to me. But I had not haven't visited for years, and last time, in 2014, I wasn't blown away, so it took me a while to venture back again. As in, uh, 3 years. This time my visit was with 5 other co-workers, on our way from a conference in Mountain View, back up to the city. One is gluten-free, and we only learned once we were there that they had virtually no options for him. 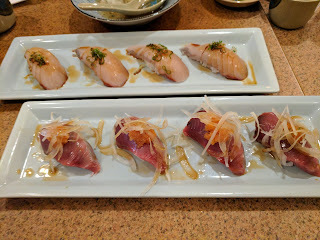 He had plain sashimi, no soy sauce, and plain steamed rice, as he couldn't have nigiri since the sushi rice often has vinegar that often has gluten. Even the ice cream for dessert was thought to have gluten (really?). Honestly, it didn't seem like the staff had a good handle on what did or did not have gluten (aka, what about the edamame? ), but, it wasn't worth the risk. Seaweed Salad, 8 Piece Omakase, Taro Agadashi, Almond Tofu, Custard Pudding. 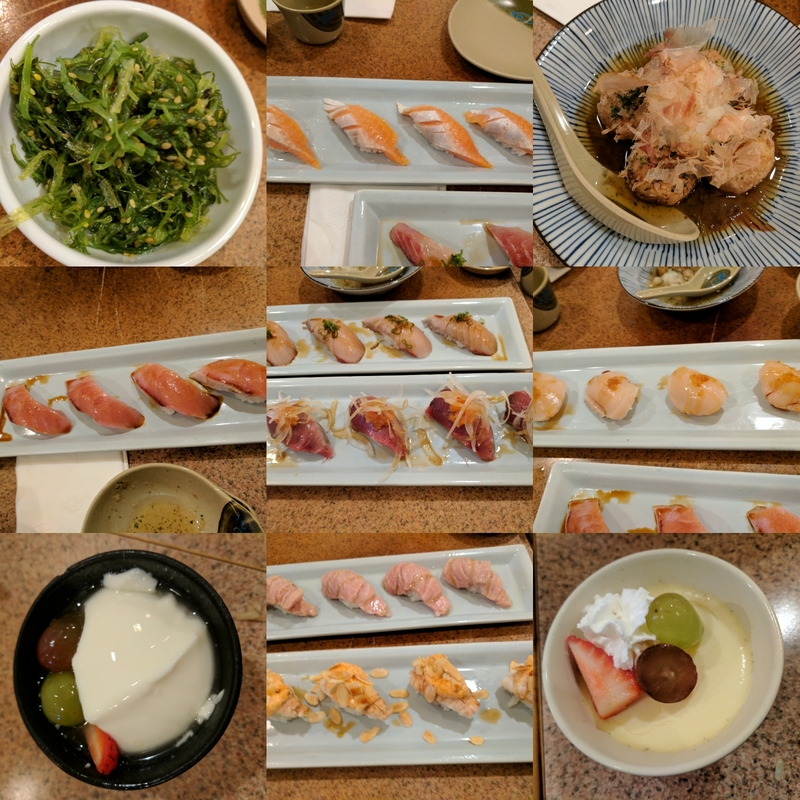 We ordered two appetizers for the table (including a special I had never had before), the smallest size omakase (8 pieces each), and, of course, the included dessert. Overall it was not particularly great. I only really enjoyed 2 pieces of sushi, and several I did not like. 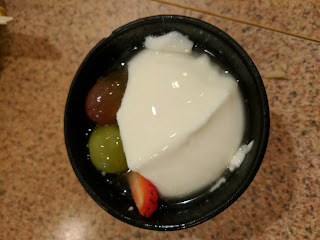 The almond tofu dessert though was still as awesome as I remembered though. 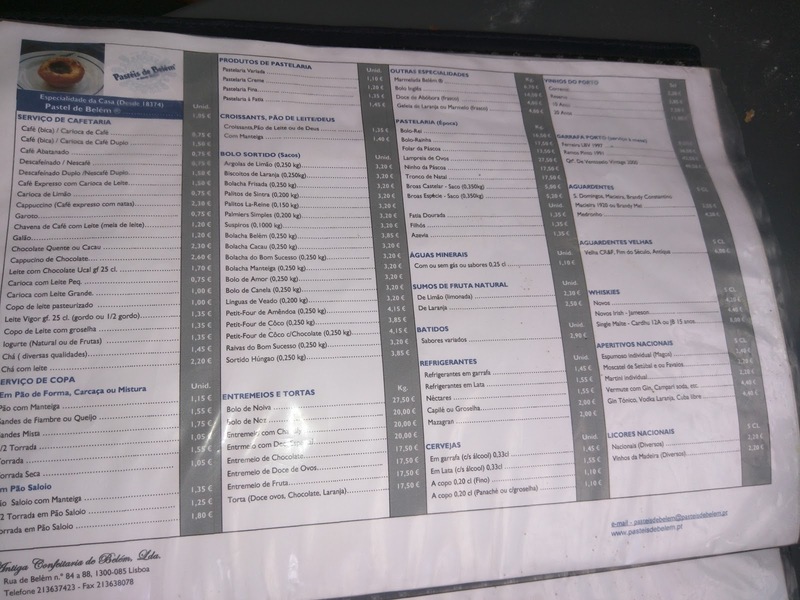 The drink options at Sushi Sam's are fairly limited: a couple choices of Japanese beer, a couple choices of sake, plum wine, soft drinks. No sparkling water. Well, this was a generous pour! 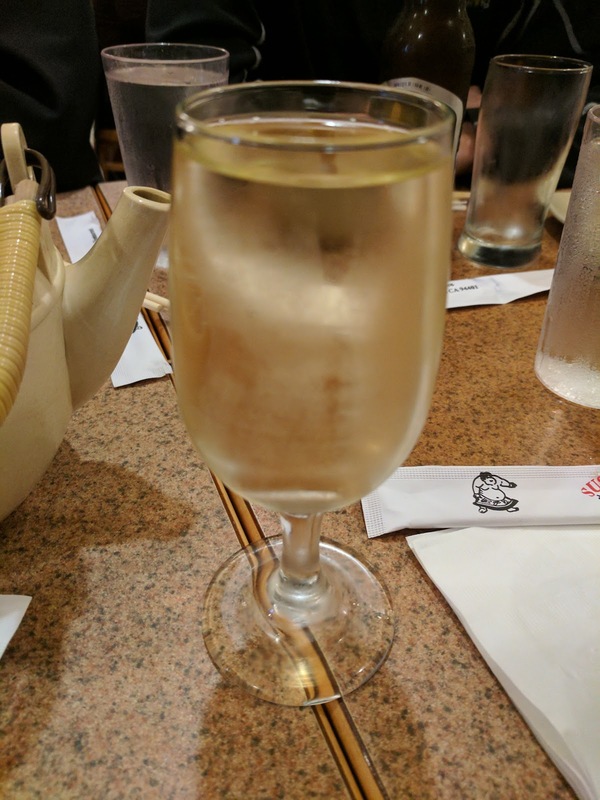 I first discovered plum wine when I started eating sushi, and I still associate it with getting sushi (unless I'm with folks who want to order sake of course). Since the rest of the group was beer (or non-alcoholic) drinkers, it seemed fitting. 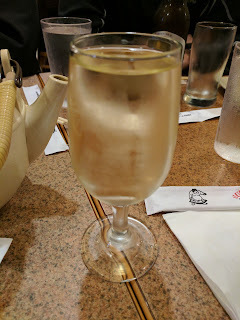 The plum wine wasn't particularly good nor bad, but it is so sweet that I didn't quite enjoy it alongside my food. I used to like this with my savory food? In the past, I always got miso soup and edamame, and sometimes seaweed salad, to eat while waiting for the main attraction at Sushi Sam's. Sometimes it could take quite a while for the sushi once ordered, and we always got apps to tide us over. 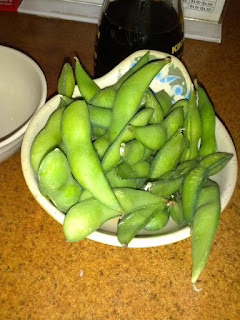 I really don't care for edamame these days though, so we skipped that, and miso soup seemed boring. I still ordered the seaweed salad so we'd have something to munch on while we waited, but our food came rapidly, so we didn't really need it. This is also the first time I noticed the appetizer specials board, filled with all sorts of fried items, including ... taro! Since I love taro, I added the taro appetizer on to our order too. 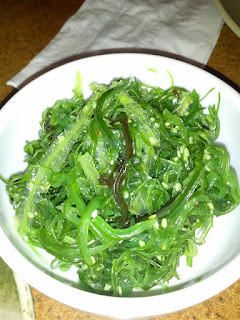 The seaweed salad was fine, unremarkable. The special appetizer menu had two taro dishes: agadashi taro and fried taro with miso. I ordered the fried taro with miso, but got this instead. Not that I knew exactly what the fried taro with miso was supposed to be, but I was hoping it was something like taro fries with a dipping sauce, so I was pretty surprised when we received this. It wasn't until after, when I looked at the menu again, that I realized an error had been made, but it was too late at that point. Anyway, these were just mushy taro balls, topped with grated daikon and bonito flakes, in a dashi broth. The balls were kinda mushy and this was just totally not what I wanted. Literally every time I have ever gone to Sushi Sam's, we have ordered the omakase. I did bring my parents there when they visited, and my dad, who doesn't eat any seafood, ordered a teriyaki dish, but besides that, we have always, always gone omakase. This time, I was tempted to actually order just what I wanted. In recent years, I've realized that I don't care for a lot of sushi. 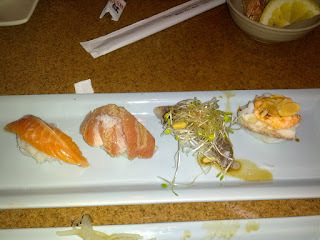 I still have a few pieces I like, but, raw fish just isn't doing it for me these days. I don't know what happened. 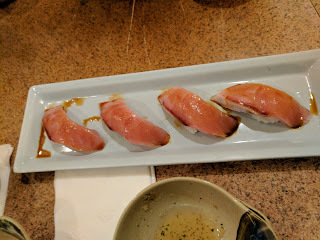 But others wanted omakase, and if I wanted to order a la carte, then I'd have to get pairs of everything, which would really cut down on my ability to try a variety, since I was the only one opting to do so. 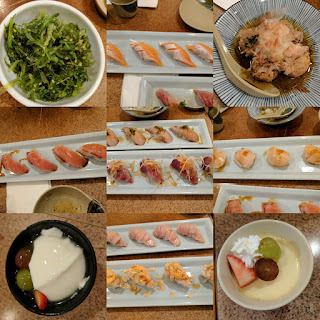 Thus, I went along with the crowd, and opted for the 8 piece omakase, but specified no shrimp and no mackerel, since I knew I really didn't want those items. Spoiler: we still got mackerel. Our first pair started with artic char, generally an option I enjoy. It was ok, not fishy, good firmness, but, overall, eh. My 4th pick overall, and I wouldn't really want it again. Alongside the char was another piece the server described as being like sea bass. Since I don't normally like sea bass, and I wasn't actually very hungry, I opted to skip this one. Another diner said it was a bit chewy. 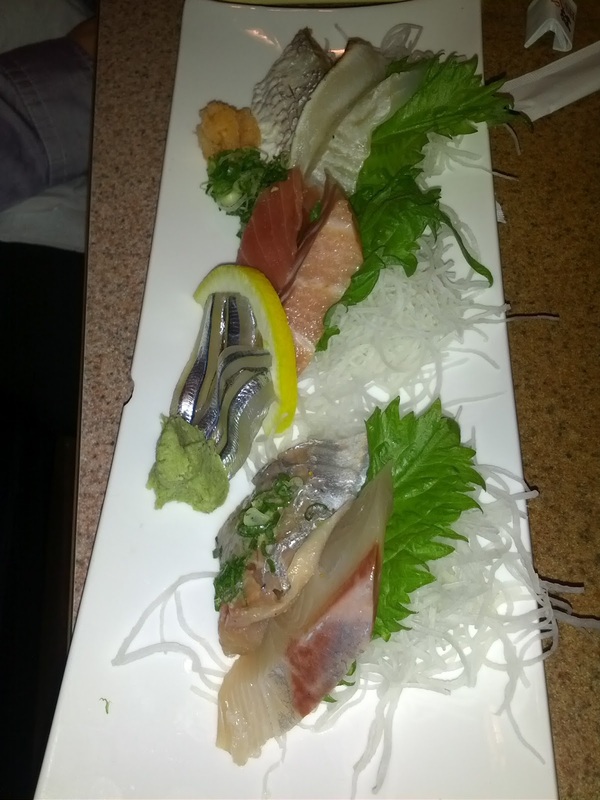 The next pair started with glistening wild yellowtail. It looked so different from most yellowtail that I actually forgot what it was ... until I took a bite. I never like raw yellowtail. It tastes meaty and bloody, in an unpleasant way, to me. My least favorite. 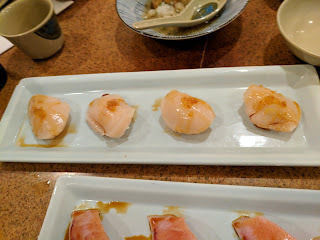 With the yellowtail was scallop. I realized I maybe should have said no scallops. I do love scallops, but, I love seared scallops. For some reason, raw scallop is always quite boring to me. I don't want it cooked through, nothing makes me sadder than a seared scallop that isn't mid-rare, but, raw scallops just don't do it for me. Which is about how I felt about this. It was inoffensive. It had a slight sweetness. The scallops were huge. But ... just, boring. 5th pick overall. Spanish Mackerel (back). Bonito (front). I specified no mackerel, but ... got mackerel. Oh well. The mackerel was actually not bad. A smooth flavor, if that makes any sense. Firm texture. It ended up being my 3rd pick overall, so, I guess I'm not too upset that I received it. The other member of the pair was bonito. Like yellowtail, I don't tend to like bonito. It just tastes like blood to me. I did, as always, like the onions on top. 6th pick overall. Seared Toro (back). Baby Lobster (front). Our final pair was the best, two items I planned to order if I was ordering a la carte. I was grateful they were included. Anticipating the baby lobster being my favorite piece, I started with the seared toro. It was very good. Rich, melt in your mouth, falling apart from its fattiness. The hint of citrus and salt added are amazing. I described it as "like salty butter", to my dining companions. My favorite piece of the night, and the first item I actually enjoyed, and would want again. With that lovely flavor in my mouth, it was time to move to the baby lobster, which felt a bit backwards. The baby lobster was fine, the lobster itself kinda eh, but I really do love the creamy flavorful mayo and crunchy roe and almond slivers on top. My second favorite, and I'll continue to get it, but, it was a come down from the toro. And finally, dessert, included in the omakase, and always a highlight. We had the same options as always: green tea tiramisu (ruled out because caffeine), sesame or green tea ice cream (boring, caffeine), almond tofu, custard pudding, or, the seasonal special. Ojan and I both looked at each other in indecision. We know we both like the almond tofu and custard pudding, and sometimes the specials can be awesome (or, they can be totally awful). We asked what the special was, to help us make up our minds. It was phyllo stuffed with banana and red bean. Meh, banana. We quickly agreed to split the other two. The custard pudding was not as good as I remembered. The custard was well set, but, the flan-like syrupy caramel on the bottom didn't seem nearly as sweet, nor as plentiful. The trio of fruit (grapes and strawberry), struck me as odd as always, but, hey, this is how they do it. I didn't really want more than a few spoonfuls of this. The almond tofu on the other hand was even better than I remembered. Sweet, creamy, comforting. I love the sweet lychee syrup it is soaked in. 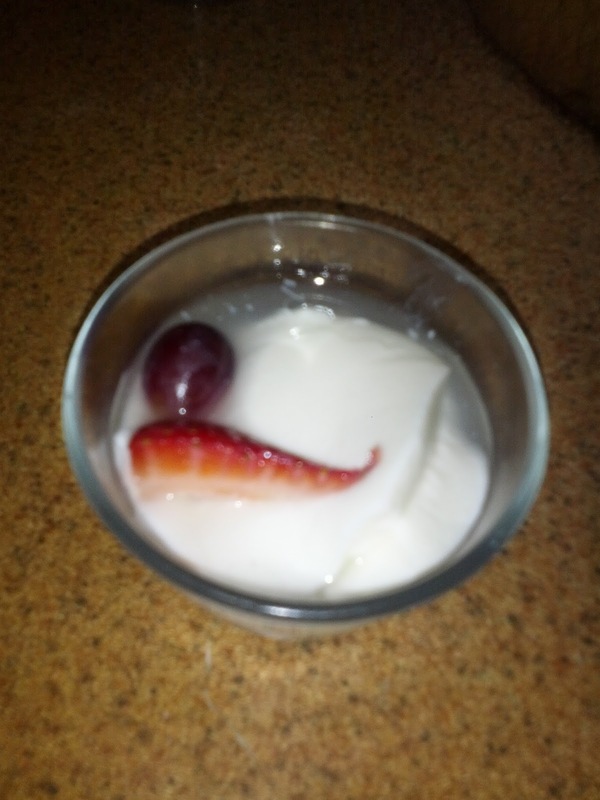 And sure, the grapes and strawberry are funny here too, but somehow, the grapes compliment the tofu really nicely. A friend first introduced me to Sushi Sam's about 6 years ago. During that trip, he instructed me on the proper way to go to Sushi Sam's: always just order the omakase. Perhaps start with some seaweed salad or edamame if you are really hungry. Bonus points for sitting at the bar, and going on Tuesday or Thursday (when they get the most fresh fish in from Japan). The omakase has at times included a random cooked appetizer, but I haven't seen them do that in a while. 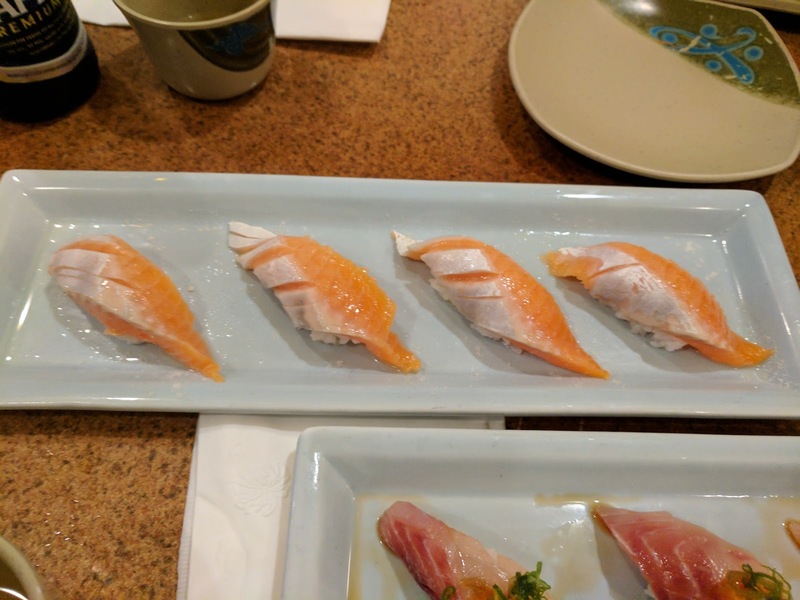 The sushi is nigiri, and usually served in sets of two. One of my favorite games is to try to decide which of the two pieces will taste better. The goal is to always have the better one second, since it will stick with you until the next set. Every person at the table should play this game with you, so not only are you competing with yourself, you get to see how everyone else picks too! The sushi all comes pre-sauced and topped. Most of the sauces are pretty subtle, some ponzu, dashi, soy, salt, citrus juice, etc, but some also include toppings like scallions, onions, sprouts, pine nuts, almonds, or even kiwi. You order a set number of pieces, minimum of 8, but can always add on more (which, we usually do). The omakase also includes dessert. Not what you'd expect at a sushi restaurant, but their dessert is surprisingly good! 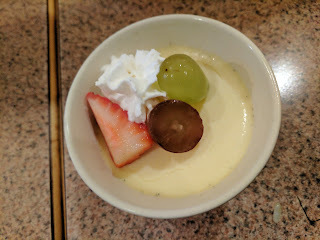 Options always include almond tofu, flan-like custard pudding, green tea tiramisu, and green tea or sesame ice cream (with or without red bean). In addition, they offer seasonal specials. I've really enjoyed almost every dessert I've had there. The staff have been the same since that first outing I went on, so many years ago. I have no idea how they have managed to retain all of the same staff for so long! Somewhat amusingly, the wait staff are all Cantonese (but the sushi chef is Japanesse). They are friendly and always have a smile to offer up, particularly for repeat customers. They always make me feel so at home! Sushi Sam's is not about the atmosphere. It is about the quality fish. The restaurant is nothing fancy, and looks like a very generic place. 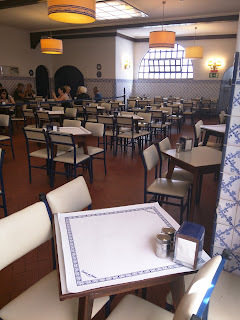 Simple wooden tables and chairs, plain white plates, paper napkins, chop sticks in paper wrappers, tea pots that leak. The service is never great, but generally does the job, taking your order and bringing the sushi at a decent rate. Prices are high, but, you are getting really high quality fish. I don't mind paying for quality (my standard order of a 12 piece omakase is usually ~$80, before tax/tip). 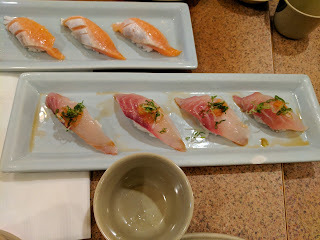 For the first few years, I used to go to Sushi Sam's at least once a month, as it just happened to be located halfway between work and home, at the junction where traffic would get bad. Such a good excuse to stop for sushi on the way back to the city! Since I no longer commute, I now only make it there a handful of times a year. It had been almost a year since we were last there, so when I had to commute today, of course Sushi Sam's was high on the list. Unfortunately, it didn't live up to past experiences. The staff is all the same, and they recognized us even after our long hiatus, and all were ready to greet us with a smile. But ... things were off. To begin with, it was very slow. Our server did warn us that they were busy and behind, and asked if we wanted appetizers while we waited. It did take a while for the sushi, but even worse was how long it took for them to realize we were done. We must have sat there 15 minutes waiting for them to come take our dessert orders, after they'd cleared away our plates and said they'd be right back to take the order, and that was only after I finally flagged someone down. But, the real problem of the night was the quality of the fish. It just wasn't there. 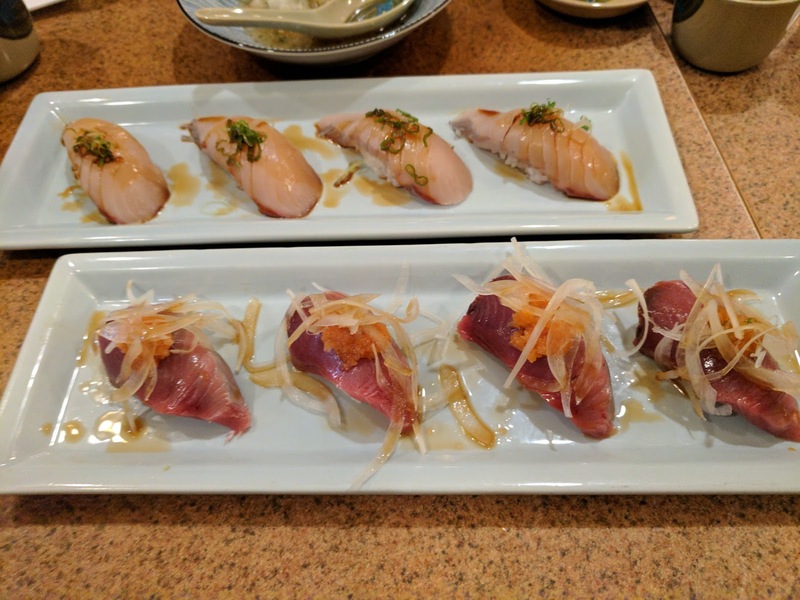 While Sushi Sam's has never been totally consistent, there are usually a few standout pieces, and the rest generally just really good. Tonight, however there was not a single piece that was mind blowingly good, and in fact, there were several that were just bad. And the sushi came in sets of four rather than two (not really a big deal, just different!) On the plus side, dessert was as good as usual! Always reliable. 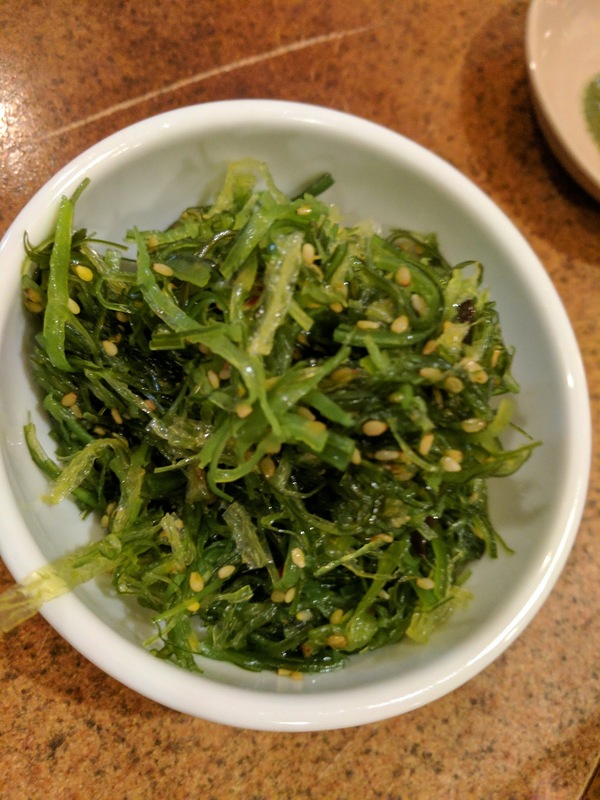 Fresh, crisp, a variety of seaweeds, lightly dressed with a sesame oil and soy sauce to give it some flavor but not overwhelm, sesame seeds for a little added crunch. Simple, classic, nicely executed. Not served warm. These always taste fresh and are pretty good, but I'd prefer them warm! Ordered by one other dining companion. We were stuffed from an epic lunch (review to be posted soon), so he went for the sashimi to keep things on the ligher side. 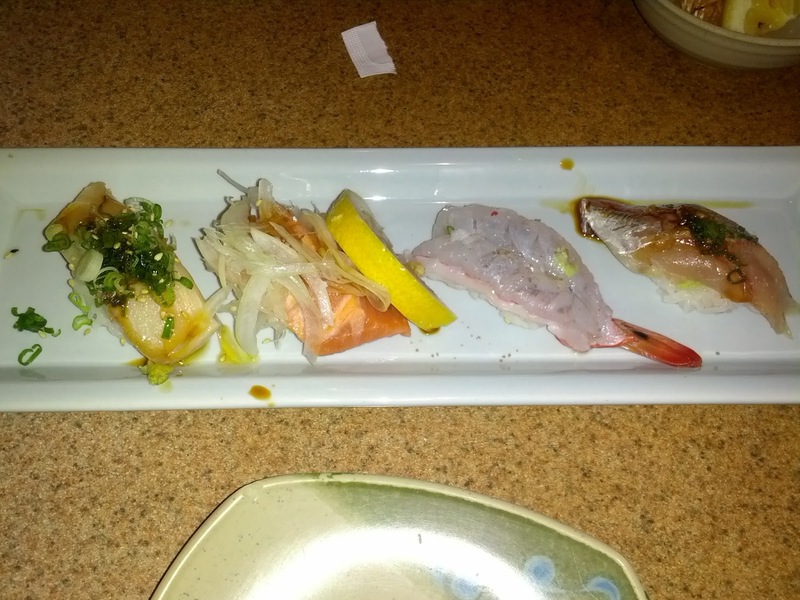 This was just standard sashimi, on special sauces or anything like the omakase nigiri. He thought the cuts were all generous, but agreed that the quality was lacking on his pieces as well. White king salmon, ocean trout, blue shrimp, aji. The white king salmon is topped with sesame seeds, scallions, and a light sauce. I always enjoy this topping combination, as it is pretty flavorful, and the sesame seeds really compliment the fish well. The salmon didn't have much flavor however, and was rather mushy. Something was off with the texture here. 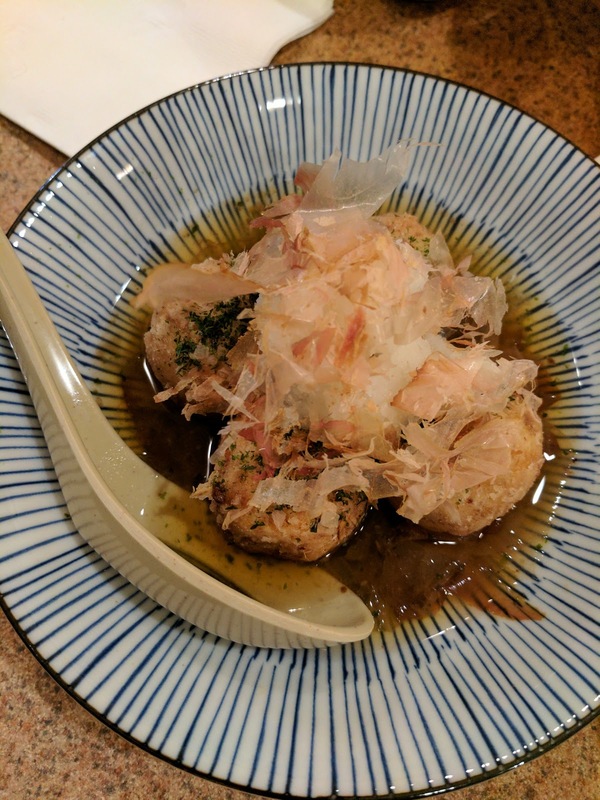 The ocean trout was lightly seared, and topped with a ton of sliced onions, and a light soy sauce. I really enjoyed the texture of this piece, with the light searing, but the flavor was completely lacking. There just wasn't any, it tasted like ... water. And there were far too many onions on it. This one was disappointing, it didn't taste bad, it just really didn't taste anything! The blue shrimp was horrible. As always, it had a nice light citrus sauce and salt on it. 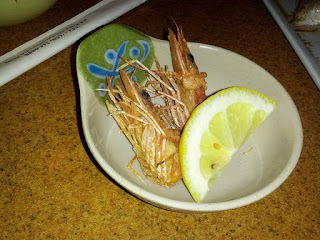 I usually love this one, as the citrus, salt, and shrimp just go together so well, which they did tonight as well, except the shrimp itself was chewy, stringy, and just really, really bad. The aji was a very simple preparation, with a tiny amount of soy sauce and scallions on top. It was firm and decent texture, but too fishy for my taste. I don't tend to like aji that much however, so I think this one was just preference. Deep fried heads of our shrimp. I skipped this tonight, but it is usually just crispy, crispy, crispy! Artic char, seared toro, snapper, baby lobster. The artic char was probably the best piece of the night. Flavored with some lemon and salt that complimented it nicely. Good texture, good flavor. Not mind blowing or anything, but a solid piece of fish. The seared toro was really disappointing. It arrived cold. And it had way, way, way too much salt on it (you can see the MOUND on top there). It was kinda stringy and not particular good on top of all that. The snapper was buried under a pile of sprouts, pine nuts, and soy sauce. I usually really like these toppings, and find them fresh and refreshing. Which I did tonight, except that I really didn't like the snapper. It was soggy. Basically take the mushy texture from the white king salmon and the waterloggedness from the ocean trout, and you get this piece. Except it was also slimy from the skin. Really quite awful. The baby lobster is my longtime favorite. The first time I loved it was probably due to the novelty - OMG, a baby lobster! And then next zillion times was probably due to the mayo. I've since come to appreciate the fish more, and this one has stopped being sooo amazing to me, but it was still pretty solid. It is a cooked little baby lobster, topped with roe-mayo, topped with almond slivers. The lobster is a great texture, the roe-mayo adds a perfect amount of creamyness, and the almonds give it some crunch. Delicious, fun, and ... mayo! 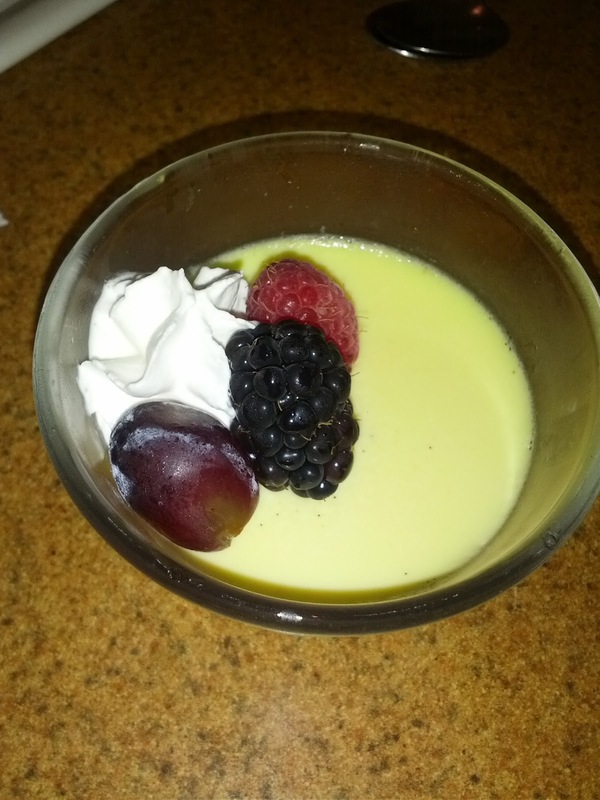 Custard pudding, chantilly cream, grape, blackberry, raspberry. This is basically an inverted flan. What you can't see is that the bottom layer is caramel syrup. The syrup was quite bitter, with the flavor more like the top of crème brûlée rather than a more typically sweet flan. The custard, while not all that flavorful, was not too sweet, creamy, and a nice fairly firm texture. The fruit and cream on top were nice additions. Overall, not amazing, but pretty enjoyable. Seasonal special: orange yogurt panna cotta. 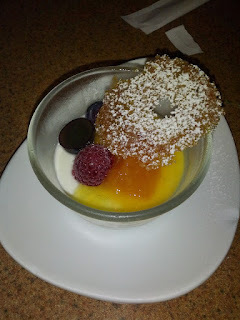 This was basically just a tart yogurt, topped with some orange puree, topped with some fresh fruit including a very sour grapefruit segment, and a crazy thin powdered sugar cookie thing. Other than the cookie, this wasn't really dessert to me, much more of a breakfast parfait. It didn't have much sweetness at all. The cookie was too thin to really have any flavor, was most just a conduit for a little powdered sugar. I wouldn't get this again. Always my favorite! Creamy, soft tofu with a great almond flavor to it, in a sweet syrup. Love it. Normally when Ojan attends conferences, there is a good chance that I also need to attend, or, that the conference is in a city with a Google office that it makes sense for me to visit, so we often travel together and combine our trips. This year however, he had a conference in Lisbon, a place I had never been, and, we did not have a Google office. I missed out on his last few trips (to Japan and New York!) due to my work commitments, but this time, I was able to take a few vacation days. I wanted a few days of summer! I also knew about 20-30 others attending, and knew it would be a fun time to crash some of their evening activities. But, it meant that this wasn’t a business trip for me, so, I was paying my own way. I needed to get to Lisbon … cheap. Thus, we flew on TAP Portugal. In economy. The boarding process in London was amazingly efficient and orderly. They (gasp) board from the back of the plane first, which meant we were nearly last, but, just makes so much more sense. Our departure time for the first flight was scheduled for 7:50pm from Heathrow, but amusingly, as we were onboard, we both got messages saying our flight had been changed … to 7:40pm! Score, we were leaving earlier? Except, we didn’t. We left the gate then, but spent a long time out on the runway with no communication from the flight crew. We took off at least half an hour late. I still don’t know why. 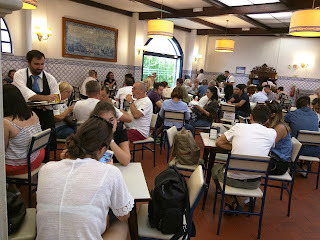 The return flight from Lisbon was the opposite. Boarding was late, a total mass free-for-all, and somehow we still took off on time and arrived early. Anyway, yeah, TAP. I was flying a generic, lower-end airline, on intra-Europe flights, with flight times of less than 2.5 hours. Thus, I knew to set my catering expectations accordingly. 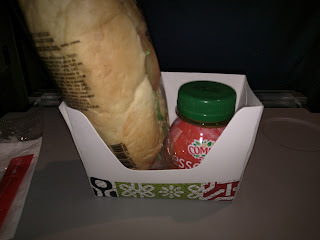 Snack Box: Sandwich, Mango Juice. After we got underway, the trolleys came through with basic soft drinks, coffee, and tea, and … our meal. There were no choices. I tried to order vegetarian online before the flight, but it said that choices are no longer offered in economy. However, others on the flight got them, and when I asked, the attendant told me I needed to do it in advance online. Hmmph. The meal boxes were distributed without a word. The writing on the wrapper was in Portuguese. This was going to be fun! And what did we have? A little tiny drink, that was … mango puree? Super thick, super sweet, like a smoothie I guess. The consistency was too weird for me. And, a sandwich. 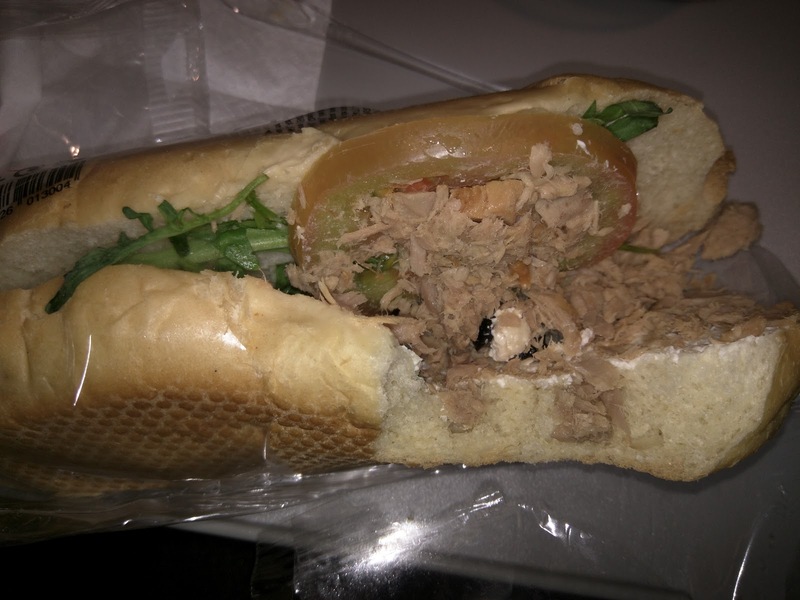 A tuna sandwich, it turned out. The top piece of bread was very dried out and stale. The bottom was less bad, as it was slathered with what I think was cream cheese, so it kept a little moisture. The tuna, canned, flaked, cooked tuna, was on top of that. Also in the mix were a couple bits of black olive, a single slice of incredibly unripe tomato, and literally 3 pieces of arugula, and one piece of basil. This was so strange. Tuna and cream cheese? Tuna and mayo, sure. Tuna and hard, sliced cheese, sure. Salmon and cream cheese, sure. But tuna and cream cheese was a new one for me. Perhaps this is a Portuguese thing? 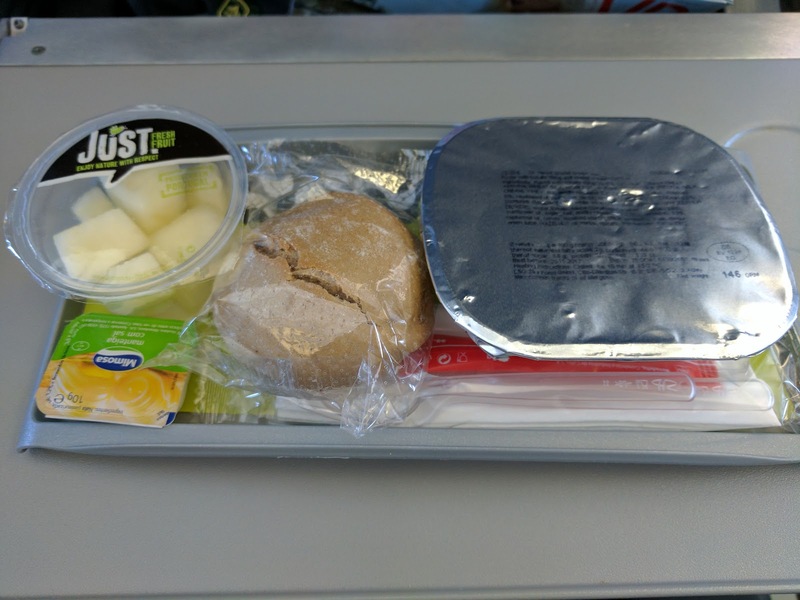 On my first TAP Portugal flight, we were served what I thought was a meal, but turned out to just be “snack”. It was a pretty awful tuna sandwich with mango juice. Thus, I had no expectations for my next flight, and brought my own food. Since the flight departed right at noon though, we were served lunch, a hot meal, even though the flight was only 2 hours. I wasn’t expecting that. As my first flight, there was no meal option, and it was plopped down in front of us without explanation. Wheat Roll, Butter with Salt, Melon Bowl, Hot Meal. The meal option was actually vegetarian for everyone: pasta. I was pleasantly surprised as pasta is one of the few things that I’ve had be decent in economy class on airplanes. Also on our trays was a wheat roll with butter that Ojan and I both didn’t try as it looked stale, and dessert … a little pot of melon. Since I’m allergic I also didn’t have that, but Ojan said it was ok, not the ripest ever, but refreshing enough. I was glad I brought alternate dessert waiting for me. "Pasta with tomato filling and shallot cream sauce." 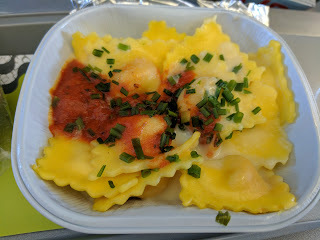 The ravioli was tomato and ricotta cheese stuffed veggie pasta, small little raviolis. The filling didn’t really taste tomato as listed, but you could see it was a radish-pinkish color. It had a good ricotta flavor and the pasta itself wasn’t horrible, not mushy, not hard. But my meal was lukewarm at best, actually kinda cold. This is in contrast to Ojan, who had a piping hot one, and he was seated next to me, complaining about how it was too hot. Inconsistent. 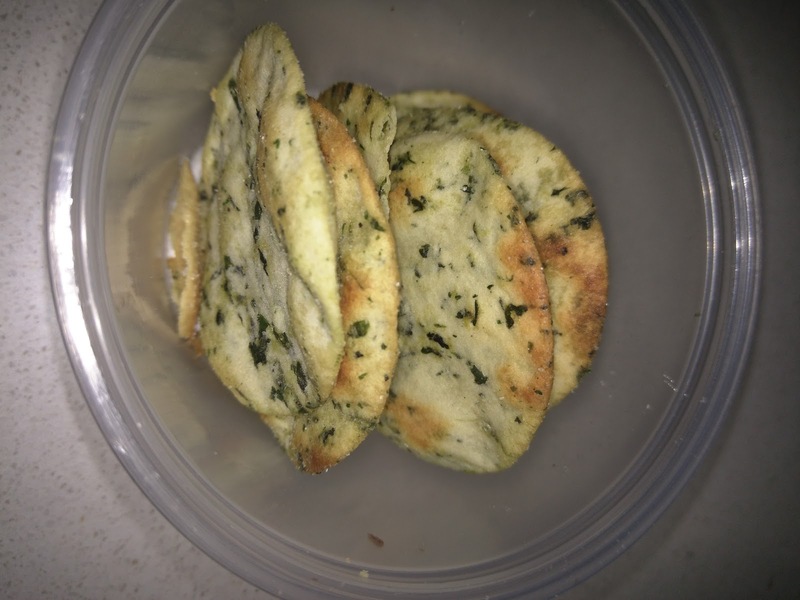 So, the ravioli itself was … fine, nothing special, but edible. But you know me, I’m a sauce girl, and um, shallot cream sauce!!! This had promise. The sauce was ok. I didn’t really taste shallots, but, it was cream sauce, and it wasn’t totally bland. I lapped up the sauce eagerly, and used some of the other food I brought to dunk into it once the ravioli was gone. More surprising was the tomato sauce. There was only one spoonful, but, it was actually really good, it had big chunks of tomato, was slightly sweet, and well, I liked it. Random, but quite good. So, overall, certainly not fine dining, certainly not amazing, but, for an economy class meal, really not bad. 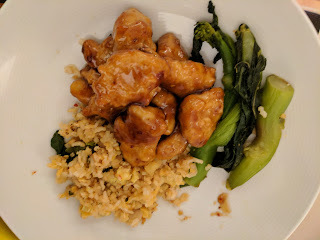 Most of the time that I write in this blog, I'm reviewing food prepared by someone else, generally a restaurant or cafe, or sometimes packaged snacks. I never review the food cooked by friends or family, or, gasp, by myself (unless we are talking about waffling leftovers of course). But sometimes I'm given the opportunity to review meal kits, like Fresh Express Salad Kits, although most I often fail to actually write up. This time, I took care to take photos and notes. Innovasian is a company that makes frozen Asian meal kits, including appetizers (egg rolls, potstickers), sides (white rice, veggie or chicken fried rice, lo mein), and entrees, like beef & broccoli or chicken in about a zillion forms (General Tso's chicken, sweet & sour chicken, orange chicken, garlic chicken, chicken & broccoli, sesame chicken, kung pao chicken, sriracha chicken, asian style bbq chicken, lemon chicken). The used to have a Thai product line, called "Lemongrass Kitchen", that seems to have vanished from the market (although I was able to pick up some pad thai before it vanished). The products are all frozen and require very little prep besides unthawing, opening of packets, and stirring. The hardest part is picking a cooking method. Each product includes instructions for oven, pan fry, and microwave, with recommended options highlighted for each product. Interestingly, pan fry is not always the recommended prep, and microwave even wins from time to time. 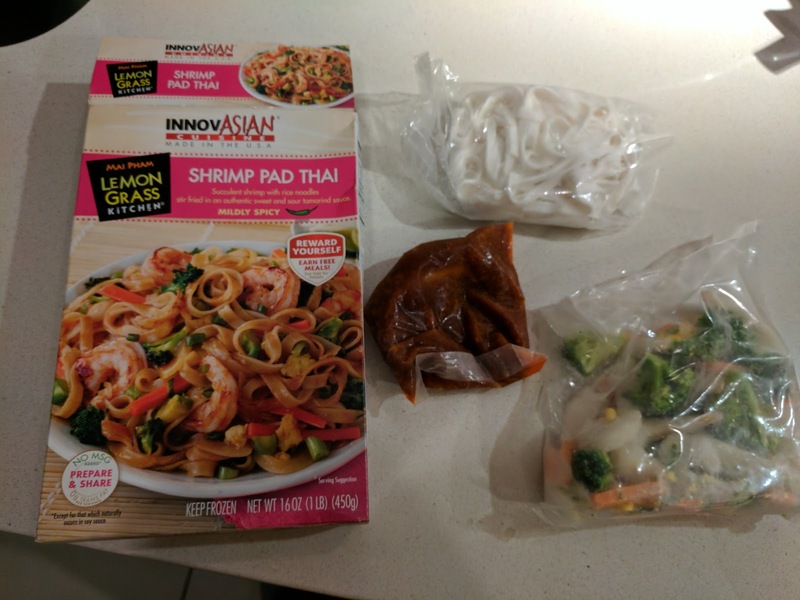 I tried one item from the regular product line (General Tso's Chicken), and one from the now unavailable Lemongrass Kitchen line (Shrimp Pad Thai). Both were simple to prepare, but, about the quality you'd expect from a frozen meal. You would never mistake this for freshly prepared food, but, if you are a frozen meal sort, I think they are a step up from a zero-prep frozen meal. 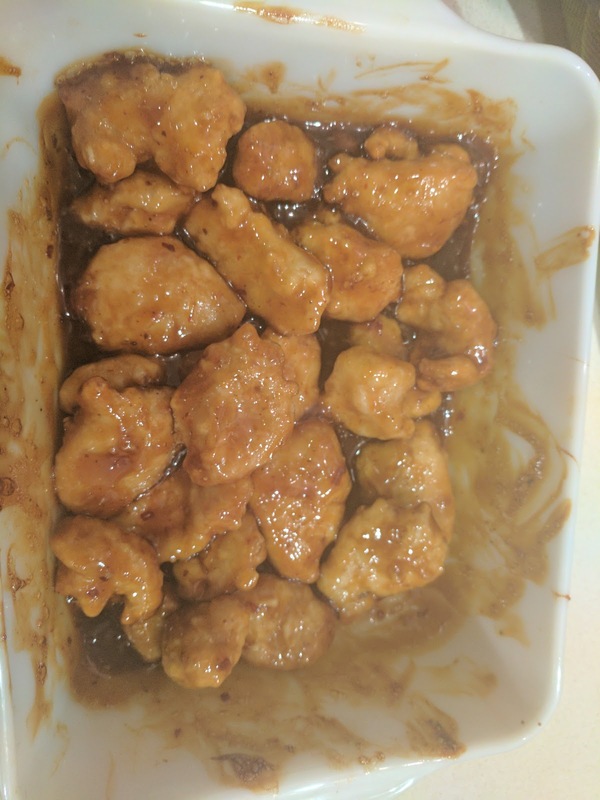 "Lightly battered tempura chicken breast and a spicy Asian style BBQ sauce with sesame seeds and chili pepper flakes." 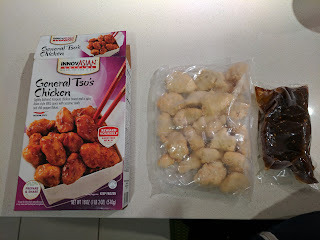 We decided to pick one of the many chicken options, and went with General Tso's. 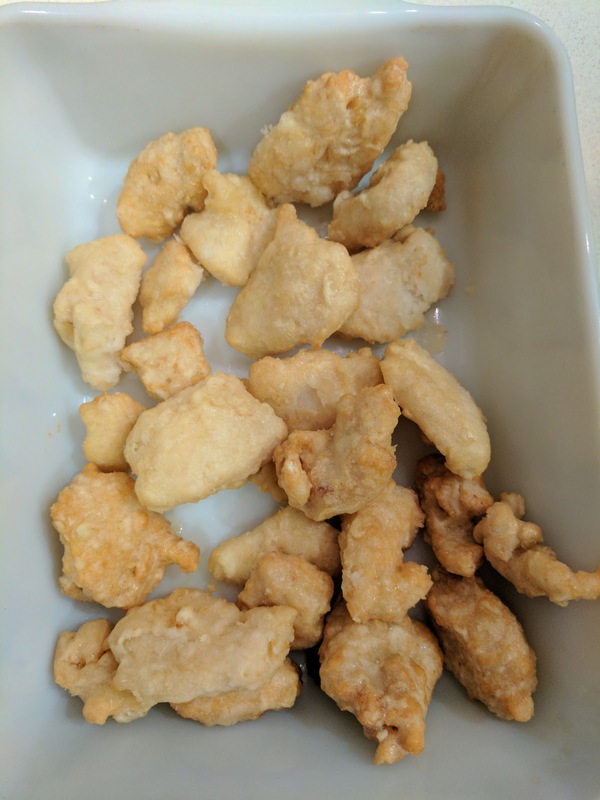 It was one of many chicken options that looked nearly identical, all battered chicken with a sauce package on the side. The chicken and sauce came separately. For this dish, oven was the "preferred method" on the box, so I went with it, even though pan frying sounded more sensible. The first step, after preheating the oven, was the place my frozen sauce bag in a bowl of warm water to thaw it. I think this was the hardest step. Step 2: Frozen chicken in baking dish. 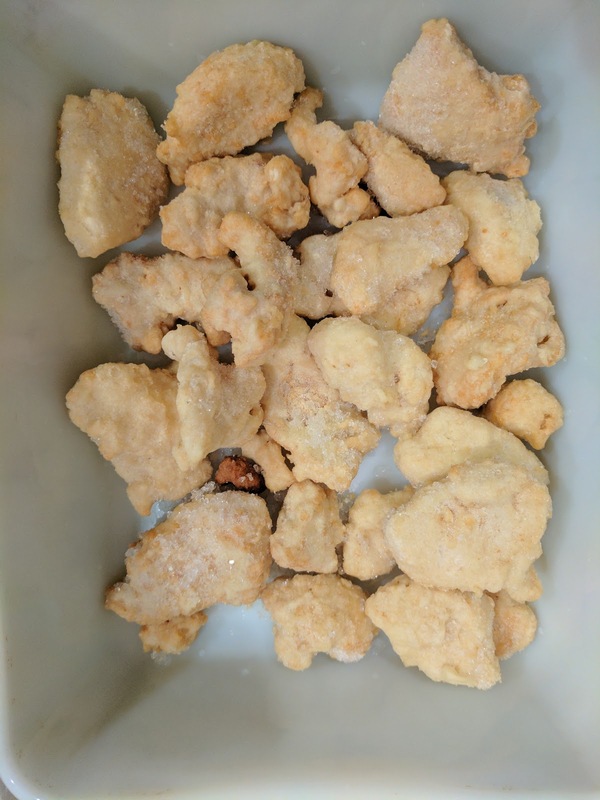 "Open bag of chicken and empty into an oven safe container." "Bake uncovered for 15 - 17 minutes." Easy peasy. I didn't even need to stir or flip it? The chicken was nice and crispy at this point, not necessarily fresh out of the fryer, but, decently crispy. "Open bag of sauce. Stir in sauce with chicken and bake for an additional 5 minutes or until hot." And ... that was it. I did lament that the crispy chicken was now a bit soggy. I plated it up with fried rice and sautéed asian greens, and, I'll admit, it looked pretty good. It was ... ok. The chicken pieces were processed chicken, like chicken nuggets, but if you like that sort of thing, these seemed fine. The sauce was sweet and sticky, but not really spicy as I hoped. Really, I got this for Ojan, and he seemed to enjoy it enough. I only tried a bite of chicken and mostly lapped up some sauce, since I'm a sauce girl. "Succulent shrimp with rice noodles stir fried in an authentic sweet and sour thamarind sauce. Mildly Spicy." I had my eyes more on the pad thai kit, as I used to make pad thai all the time in grad school. This kit came with 3 bags, one for sauce, one for veggies and shrimp, and one for noodles. Interestingly, this preferred cooking method was ... microwave. Microwave? Really? I was very, very tempted to go for the pan frying instructions, but trusted that they knew how to make it come out best. Again, my first step was to put my sauce packet in a bowl of water to thaw. I was getting the hang of this. Step 2 was to put the bag of noodles, yes, the entire bag, no venting or anything, in the microwave for 45 seconds. Uh, ok? 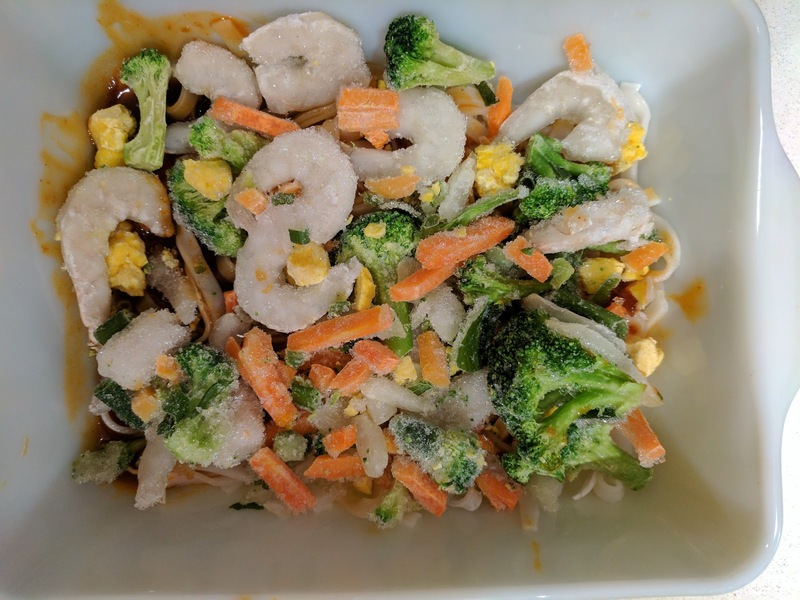 After 45 seconds, I was supposed to dump the noodles into a casserole dish, dump the now-thawed sauce on top, and then dump the totally frozen shrimp and vegetables on top of that. This process was ... strange. The noodles, after 45 seconds in the microwave in their bag, were still frozen clumps in some places, and actually hot in others. The sauce was now lukewarm and completely thawed. But the shrimp and veggies were rock solid. I did my best to break it all up, even though the instructions didn't tell me to. Once all in the casserole, I was to cover with plastic wrap, poke holes in the plastic, microwave for 4-5 minutes, let stand one minute, and then ... eat. This was the completed product, after I stirred it up. The photo is hazy because steam was escaping from it. I meant to take a picture of the final, plated product, garnished with chopped peanuts (the instructions did suggest that you could add crushed peanuts, bean sprouts, or lime wedges), but alas, this is the best you have. It was ... again, about what you'd expect. The noodles were fine, I guess frozen rice noodles really do mircowave ok. They didn't clump together or overcook once I stirred them. The noodle portion did seem a bit skimpy though, for a product with 3 servings according to the package. But so far, so good. The veggies were decent size chunks of broccoli that did also microwave fine, a few bits of onion, and lots of batons of carrots that were incredibly generic "frozen dinner" tasting carrots. These items, particularly the carrots, get a bit "meh" rating. The shrimp portion was more generous than I expected, although they were fairly small size shrimp. They actually didn't get rubbery from microwaving, which surprised me. They were cleaned. But ... they were pretty fishy. "Meh". The yellow bits at first glance looked like corn kernels, which I'll admit confused me greatly. Once I tasted them though, I realized these were bits of egg. They were pretty gross. Protip: don't freeze and then mircowave egg? Minus one point for sure. But you know me, I'm in it for the sauce. The sauce ... was very, very sweet. I know pad thai can be pretty sweet, and I love sweet, but this was a bit much. It wasn't a very complex sweet, and certainly lacked any of the promised "mildly spicy". 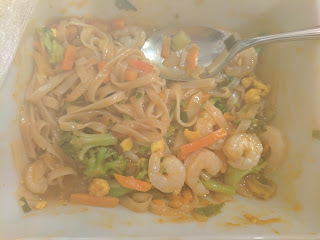 The sauce was also fairly thin and watery, and didn't stick to the noodles or coat the veggies in any real way. Overall, this was ok actually, although not great, and I don't understand why the mircowave was listed as the preferred heating technique. Do they really not trust me to toss this around in a wok?